AppWall application is designed for rendering the Unigine world into the configurable number of windows. The number of AppWall monitors is not limited. They can fit any display configuration and can be rendered both in the windowed and the full screen mode. The maximum supported number of monitors is 6. In case you use one of these configurations, you only need to specify a plugin library (lib/AppWall_*) with the usually required start-up arguments (such as rendering API, window size, etc.) in the launcher. Unigine engine automatically detects the number of available monitors and if they fit any of the supported configurations, it automatically creates the appropriate number of windows with Unigine viewports. Do not forget to specify other required start-up arguments as well! AppWall can be easily customized to support the desired configuration of monitors. You can create AppWall that renders Unigine viewports into the arbitrary number of windows with custom viewing frustums (symmetric or asymmetric ones). AppWall have one primary viewport, while all others are rendered as auxiliary ones. By default, the primary display is the Unigine engine viewport used for one-monitor configuration. It uses matrices of the Player used by the engine to view the scene. Other displays are arbitrary cameras with any perspective and facing whatever direction needed. Each display has its own model-view and projection matrices. Both the primary monitor and auxiliary ones can be enabled or disabled, if necessary. The primary display can be set to any monitor (for supported configurations it is already set). Each display has its own model-view and projection matrices. By default, only a primary one has an interface (render system GUI, editor widgets, wireframe, or the profiler). However, separate GUIs can be drawn on all monitors (see the sample for more details). For 1×1 configuration, the 1st (and only) display. For 2×1 configuration, the 1st display. For 3×1 configuration, the 2nd display. For 4×1 configuration, the 2nd display. For 5×1 configuration, the 3rd display. For 1×2 configuration, the 1st display in the column. For 2×2 configuration, the 1st display in the 1st row. For 3×2 configuration, the 2nd display in the 1st row. Rendering of AppWall viewports is controlled by wall.h script (located in <UnigineSDK>/data/core/scripts/system). Also you can directly modify the wall.h script. The AppWall renderer itself (which is safer if you are going to use asymmetric frustum for the primary monitor and modify its model-view matrix). The following example demonstrates how to create a 3×1 monitor configuration and choose the renderer for the primary monitor. The first variant is to render the primary monitor by the default engine renderer. // it is positioned in the first line of monitors. Enable all auxiliary monitors via engine.wall.setEnabled() (they are disabled by default). The primary one should be disabled, as it is drawn by the default engine renderer. // Enable the 1st and the 3rd monitors in the first row. // The third argument of the function sets 'enabled' flag. Set projection and model-view matrices for auxiliary monitors via engine.wall.setProjection() and engine.wall.setModelview(). Another variant is to render the primary monitor by the AppWall renderer. This variant can be used, for example, if you want to set up symmetric frustums for all monitors. 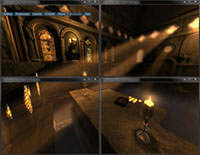 Set model-view and projection matrices for all three monitors.